For some future projects I have in mind I would like to add a USB interface to my Calunium development board, rather than using the Sparkfun FTDI basic breakout board that I have been using. One of the key features is that it should work seamlessly with the jumper-selectable 3.3V or 5V operation offered by Calunium v2, which is most easily accomplished by a self-powered design; auto-reset is a bonus. Microchip offer the MCP2200 USB interface in a choice of packages including a 20 pin SOIC package which is very convenient for home assembly of PCBs. 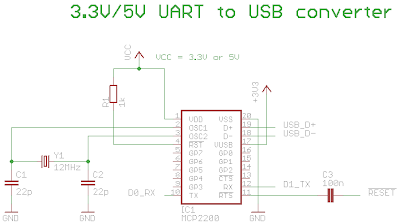 I found conflicting information about the MCP2200 so I prototyped the above circuit to check that mixed 3.3V/5V operation was ok. VUSB (pin 17) is permanently connected to 3.3V so that the USB signalling levels are always correct. The VDD supply pin is connected to IOREF on my Calunium board, which is either 3.3V or 5V, depending on the position of the voltage selection jumper, ensuring that the logic levels for the MCP2200 match those used by the microcontroller. I also wanted to test whether the MCP2200 would auto-reset the microcontroller. The MCP2200 doesn't have a DTR output pin which is how modern Arduinos reset the microcontroller for uploading a new sketch. Fortunately the MCP2200 does have an RTS output, and as that was the method used by older Arduinos I connected that to /RESET via a 100nF capacitor. After building the circuit and connecting it to my Ubuntu 10.04 Linux computer the MCP2200 was immediately recognised, I used the dmesg command to see this. Ubuntu automatically created the /dev/ttyACM0 device file, no configuration changes were needed at all. Using gtkterm I was able to toggle the state of the RTS pin. I then hooked up the circuit to one of my Calunium microcontroller boards and was able to upload sketches without needing to press the reset button, in both 3.3V and 5V operation modes. I haven't tested this from Windows but from what I've read on the Microchip forum I suspect it won't work due to deficiencies in the Windows driver. The datasheet suggests that a ceramic resonator can be used instead of the crystal and load capacitors. I found it did work even though the resonator's frequency tolerance was 0.5%, not 0.25% as required by the USB specification. As I can't source any resonators which meet the specification I'll be using a 12MHz crystal. The MCP2200 wasn't my first choice; the obvious part was the FTDI FT232RL, although I had reservations about working with an SSOP package. Further investigation revealed that 3.3V operation requires an external crystal, but to use one isn't straightforward. On first use the FT232RL must be powered from >= 4.0V and a custom utility (not openly supplied?) is needed to select the external crystal. The standard MPROG utility cannot be used for this. I am aware that the FT232RL could be powered from the USB 5V supply but I am not a big fan of powering devices simultaneously from both internal and external supplies. One of the future projects is to replace hardware which is powered from multiple sources and is very susceptible to damage from being powered up/down incorrectly. 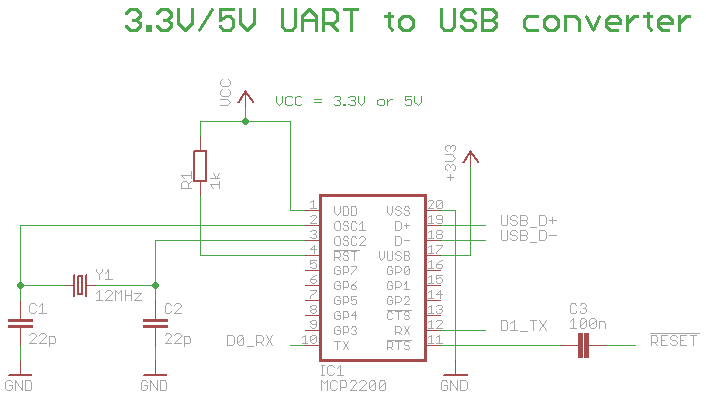 In conclusion, this is a very useful USB converter for Linux users and for final designs. Windows users who wish to regularly upload new firmware via a bootloader may find it less useful.